Bringing a new puppy into your home is a new and exciting experience. There are a lot of things you need to consider to better prepare yourself for a new journey with your four-legged companion. Our experience showed us that there are some essential steps to take before taking your pup home. So, you must consider puppy proofing your home, medicine and food selection, and preparing your puppy’s first toys. If you are a first-time dog owner, you’ll need more time to get ready for this experience. If you have kids, you need to take special measures to ensure your puppy will be safe. In order to puppy proof your house, you need to keep your trash in covered and secured cans. This will keep your puppy away from consuming toxic substances, swallowing objects that cause internal obstruction or being at risk of suffocation if he catches his head in a bag. Remove all cord covers, batteries, electric cords, chargers, power cables, and deterrent sprays that may expose your pup to accidental shock or burns to his mouth. Keep all your bags out of reach to avoid poisoning from toxic substances. Store the bags in a closed area where your puppy cannot reach. Store your medications in a secure place, separately from pet medications, where your pup doesn’t have access. Most of human drugs are poisonous to dogs. Make sure you don’t have toxic plants as they can cause severe issues, being even deadly for your puppy. Some of the most dangerous and common plants are the American Yew, Autumn Crocus, Sago Palm and Castor Bean. Keep all household cleaners, detergents, and other toxic substances in a secured place, out of your puppy’s reach. Create a safe space for your pup to play and rest. A good idea is to put him in a crate where he may stay whenever you are not home. Set up baby gates to limit your puppy’ access to places you don’t want them to go. Puppies are curious and playful, and they tend to explore all the places they can reach. Remove all other small objects that can be swallowed or chewed by your pup. Walk through all areas to make sure there are no dangerous objects in his way. 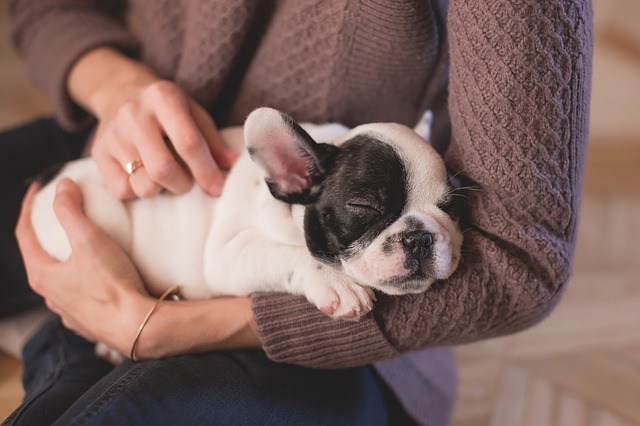 In order to be well-prepared to receive your puppy in a secure environment, you should also have some medications at hand in case you need them. Buy some heat discs from a pet supply outlet. Put them in the microwave before using them. If your pup won’t eat well, you can give him Karo Syrup to energize him. For vomiting or diarrhea, you can use Kaopectate, Pepto Bismol or Benadryl. In case of a high temperature, you can measure it with the aid of a rectal thermometer. Complete your stock with disposable syringes, 3cc & 10cc sizes, that you can use for giving liquid medications and a nozzle-tipped syringe that you can use for giving liquid food, as well as isopropyl alcohol, 3% hydrogen peroxide, diphenhydramine, triple antibiotic ointment, bandages, and tape. They are helpful in case of injury or emergency. Due to the transition to his new home, your puppy may lose his appetite. An important aspect to get on the right track is give him the same food he was eating before the adoption. If you desire to change up his current diet, it’s important to do so for a period of 10 days, and slowly work the new food into his remaining kibble. It is recommended to select premium canned dog food to ensure he receives all the nutrients he needs to stay healthy. You can also go for meat baby foods, yogurt, eggs, beef, chicken, turkey. Serve the meat boiled, baked or steamed. A good way to make the transition easier is to be well-informed regarding your puppy’s previous routine for playing, feeding and sleeping. Leaving your puppy alone for more than 4 hours in a row decreases his adaptability to learn new things. To avoid negative effects on your puppy, make sure to get him a companion to play with or look for a pet sitter to take care of him. If you already have other pets or if you have children, it is recommended to carefully supervise your puppy in the first weeks or until there is no danger for him. He can be easily hurt by adult pets or by small children that don’t know how to approach him. Instruct your children to treat your puppy gently and slowly introduce him to your pets so they become accustomed to his presence. Extra care is needed if there are important differences in the size of your pets or if your pets display signs of aggression. Your pup feels comfortable in a secure and quiet place where he can sleep, rest, and play whenever he wants. 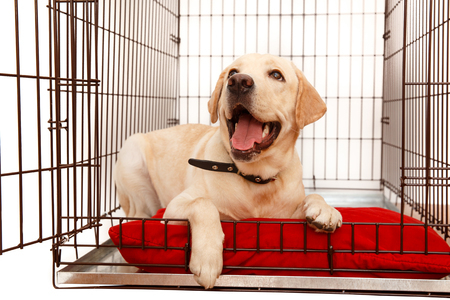 A good idea is to use a crate or secure an area in the room where he can feel comfortable. Duplicate the sleep environment he had before the adoption. Keep in mind that secureness should be your priority when it comes to creating a room for your puppy. Keep a proper temperature in his room. Your puppy’s body temperature is warmer than yours, so set a higher temperature for him. When choosing n area for your puppy, make sure it is near to yours, so you can check him regularly, including during the night. This enhances his feeling of security. Your puppy needs some cool toys to play with and entertain himself. Choose toys that seem indestructible and don’t put your pup in danger. Thin rubber or cloth toys contain squeakers that can be swallowed, so avoid them. Dogs explore with their teeth, so chewing and biting is a natural reaction to him. Get him teething toys like Puppy Kong or teething bones to relieve any discomfort they might be feeling during this stage of puppyhood. Dogs perceive their toys the way wolves perceive their prey, that’s why they like most toys that taste like food or that make a noise. They are interested in new things and, once they became familiar with their toys, they tend to lose their interest. Be careful when picking your puppy’s toys because they may harm him if they are made of small pieces or if they are a source of bacteria. These types of issues may need surgery or more aggressive treatments. 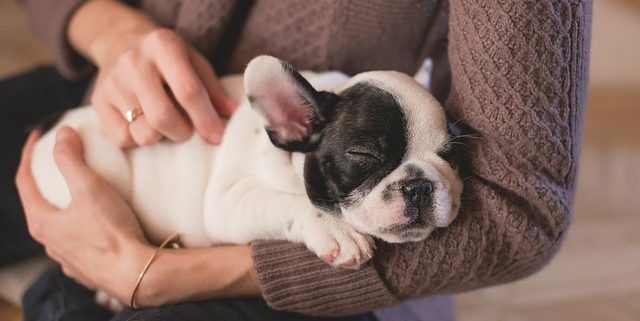 After traveling home by car or by plane, your puppy needs to rest. Prepare to greet your puppy accordingly and keep at hand a clean towel, some disposable wipes, a container of food including yogurt, boiled chicken, and water. If you bring him home by car, take 15-20 minute stops every two hours for exercise, elimination, and feeding or drinking water. Take some extra time if your puppy wants to eat or to drink water. Make sure you avoid public areas to prevent risk of disease. Keep your puppy beside you or on your lap to make him feel comfortable. This also helps strengthen the bond between you. It is possible to deal with car sickness, so it is better to avoid feeding your dog until you arrive at your destination. Once you are home, take your pup to the outdoor area you plan to use for elimination and stay there for at least fifteen minutes. As soon as you are inside, introduce your puppy to all the family members, including your other pets. Allow them to meet and play for a few minutes. 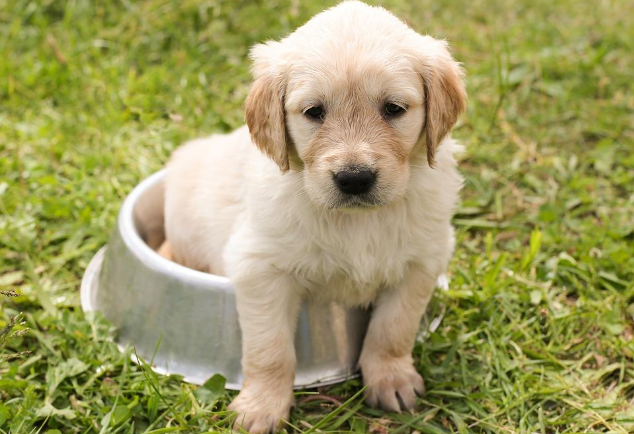 Make sure your puppy has enough water and food and establish a feeding routine to develop healthy behaviors. Check your pup’s food, water, exercise, and elimination every two hours during the day and every 4 hours during the night. Avoid leaving him alone for more than 4 hours as he may develop separation anxiety. When he wakes up, take him out for bathroom break and then offer him food and water. Plan an appointment for a health check at the vet to make sure everything is in order. #Pro Tip: Take your puppy’s age in months plus one hour to better help you figure out bathroom breaks. Meaning, if they are 2 months old, they can hold their bladder for 3 hours max. Around the time they turn 4 months old, they’ll have more control of their bladder and reach full control by the time they reach one year. Dr. Gary Rybka has a bachelor of science degree from North Carolina State University in Raleigh. He studied at the University of North Carolina in Chapel Hill. He graduated from the Auburn School of Veterinary Medicine in 1977 as a member of Phi Zeta, the National Veterinary Honor Society. He has a particular interest in pediatric medicine and surgery and has developed effective preventive and therapeutic programs for multiple animal rescue organizations. He provides medical care and mentors medical staff for over 35 years. He works closely with Premier Pups, an organization that delivers small breed puppies (Yorkie puppies, Cavachon, Cavalier King Charles Spaniel, Cavapoo, Havanese, Maltese, Pomsky, Morkie, Teddy Bear) to their new homes. He also owns DoctorPup.com, a website that provides dog owners with valuable information related to dogs.